Working at a drafting table comes with a unique set of challenges that the Humanscale Diffrient World Drafting Chair aims to overcome. The Humanscale Diffrient World Drafting Chair comes with a taller cylinder for greater height when seated, and you can choose a chair that's all mesh or mesh back with a fabric seat, depending on what your job and body call for. Adjusting the chair is done intuitively thanks to the specially designed back and recline mechanism, which move with you to provide support in all of your postures. 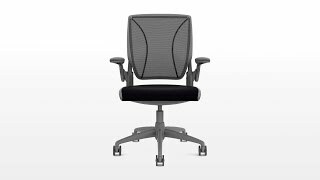 Lumbar support and form sensing mesh round out the list of ergonomic features, and the whole chair comes packaged with a stylish appearance that enhances your office flair for the better. Now, you're working better with the help of the Diffrient World Drafting Chair from Humanscale. Seat height 19" - 27.25"
The frame of the Humanscale Diffrient World Drafting Chair is available in black, white or gray. The backrest of the Humanscale Diffrient World Drafting Chair is available in the following mesh styles. Please note that certain meshes may cause a longer lead time than others. To check lead time on a certain configuration, please give us a call at 1-800-531-3746 before placing your order. The Humanscale Diffrient World Drafting Chair's cylinder has an 8" travel range. Select from one of two sizes for the foot ring. The Humanscale Diffrient World Drafting Chair is available with your choice of standard casters, soft casters for hard floors, or stationary glides. $862.00 List Price: $910.00* The list price is the same as the MSRP (Manufacturer's Suggested Retail Price). It may not necessarily be the price at which the product is sold.